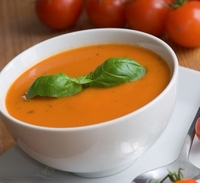 23 Jun 2015 --- Dutch potato starch specialist Avebe has launched Eliane GEL 100, a potato starch with unique properties that allows food manufacturers to create high quality, creamy and indulgent fat reduced soups, dressings and sauces. With Eliane GEL 100, up to 50% fat reduction can be achieved, while retaining a buttery mouth feel and excellent taste. Besides the unique benefits on taste and texture Eliane GEL 100 is also easy in processing with a high sheer resistance. Eliane GEL 100 works both in cook up powder mixes and in UHT processed soups and sauces. Eliane is a 'waxy potato' starch containing more than 95% amylopectin which allows preparation of foods with unique functionality, textures, expansion characteristics and cost saving opportunities. It is the world's first amylopectin potato starch obtained through traditional breeding techniques. Health and wellness trends encourage consumers to look for lower fat and reduced cholesterol versions of familiar full fat products - but without any reduction in quality, texture or taste. Avebe offers food manufacturers a range of solutions for reduced fat, premium quality and great performance.